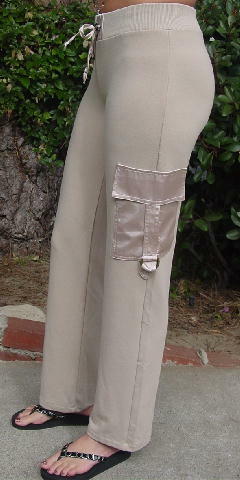 These 47% polyester, 47% viscose, and 6% elastin cargo style pants are by Sharagano and were made in France. They're in a sandy-pale cocoa color and have a 2" wide ribbed waistband that has elastic within and fabric drawstrings with a metal locking ornament. The lower two front flap pockets also extend to the back legs. They have a strap and double metal ring closure on each one. The fabric is very soft. The tag says M, but they fit more like a size S.